I used to be a vegan wannabe, but now I’m running on vegan. I became vegan at the end of January 2013 after being vegetarian since 2009. I started on this path when my husband had a health scare. We became vegetarian together and have never looked back. So, why am I vegan now? I initially became vegan because I’m severely lactose intolerant and wanted to achieve my optimal health. As time went on, I immersed myself in reading books and watching documentaries about how the dairy cows and animals are abused to produce cheese and milk, and I decided that it’s not right to torture these amazing living beings. Animals deserve to be treated like the sentient creatures in which they are. Ever since I became vegan, I haven’t felt better – mentally, physically and spiritually. I love being involved in different animal rights organizations, fighting to end animal exploitation. Living a completely ethical vegan lifestyle has taken time for me and I constantly remind myself that no one is perfect in their way of living, so doing the best that I can for the animals is a big motto I live by. I decided to create this blog to help others who are contemplating the vegan lifestyle to tell them about all the infinite plant-based food possibilities and alternatives to using animal products or by-products. I also started writing about animal rights issues to inform others on why I choose to live a compassionate lifestyle. I feel like a journey is not worth traveling alone, so I’d like your comments or advice. Cheers! Thank you so much! What a great honor! I agree, there is so much to be gained from a plant-based diet. I’m already seeing the benefits in my short amount of time being vegan. Thanks for stopping by my blog! I like your blog and started following it! Right back at ya – thanks for stopping by my blog! And thanks for the very kind words! It’s so nice building vegan connections and know I’m not in it alone! Nice to find you! I’m so glad you’re trying the vegan lifestyle, I hope you love it! I absolutely love it! Glad we connected also – I can’t wait to try out more of your recipes! Thank you so much Celeste!! I just left you a comment on your post about my visit. You are so kind to do this! You’ve got some great recipes here, I’ll definitely be back to try a few. The China Study was one of the most life altering books I’ve read. Cheers to you! Hi Victoria! Thanks so much for your kind words. Please let me know if you wind up trying any of the recipes and how they turn out. I’m always open to feedback and willing to change some stuff around based on my readers’ opinions! First, thanks for creating this page. I am enjoying your posts. I too have gone to a plant based diet. It was a slow process for me. Initially I had to get rid of dairy out of my diet due to my body developing intolerance to it. Then after seeing Forks Over Knives, Foodmatters, and Fat Sick & Nearly Dead I knew it was time to get meat and seafood out of my diet as well. I have been vegan now for almost a year and few so much better. Keep up the posts and thanks again. Thank you so much for your kind words, and thanks for reading my blog! Congratulations on your one year veganversary! I’ve never felt better, and glad you feel the same way with being vegan. Cheers! Hi Jackie! Thank you so much for the kind words! I love your pictures – they’re very captivating and beautiful! Thanks for following my blog, I followed back. Hi, there! Just wanted to let you know that I nominated your blog for the Sisterhood of the World award. Thank you for making a vegan lifestyle appealing to your audience! Just wanted to stop by and say thanks for visiting my blog. I look forward to trying out some of your recipes. My family is not vegan but we make sure we have at least one vegetarian meal a week. That’s awesome that you eat veg at least once a week! I hope the recipes turn out good for you – let me know because I’m always trying to improve them! I agree with your words about taking vegetarian diet. Great blog. I admire what you are doing to get information out to people. I invite you to check my blog: http://veggiechica.com for Latin inspired vegetarian and vegan dishes. Thank you so much for the kind comment! I’ll have to check out your blog. Cheers! I enjoyed your blog. You have some great recipes!. Great blog! 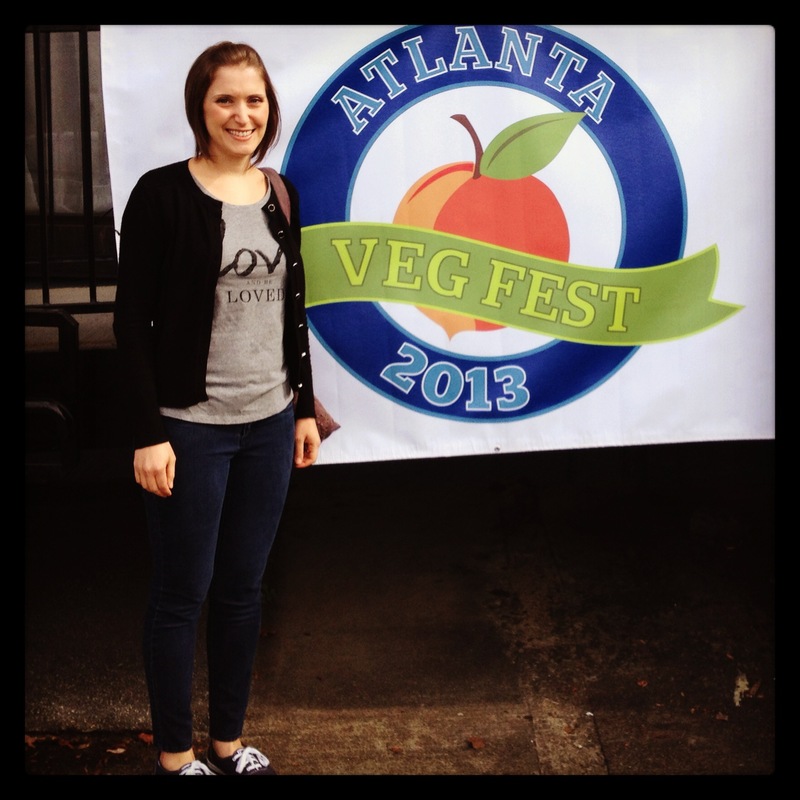 I’m vegan too since 1/1/2014 and just moved to Atlanta (although I see you have since relocated). I’m looking forward to Vegfest this November! Thank you! Too bad we missed each other in Atlanta! The people that organize VegFest are awesome! Have you connected with the Georgia Animal Rights & Protection (GARP) folks? They have incredible events and volunteer opportunities. Hey, good stuff here! Glad to see a fellow plant-powered athlete. Curious on a few things, are you a competitive runner? Or just a super-fit weekend warrior? I’d love to hear about training and racing! Also, it looks like you turned to plants from a health scare, but do you see the activism in it now? I have to say, I come from just a health-focus. Thank you very much! I’m just a weekend warrior and run for fun, so I’m far from being an expert. But, is there something specific you’d like to know about training? I feel so much better when running now that I’m completely plant based. How long have you been plant strong? Are you a runner as well? To answer your other question, I’m very much an animal rights activist. If you search “animal rights” on my blog, you’ll find out more about my activism. I’m vegan for my health, the animals and the environment – and to make this world a little bit better of a place! Thanks for reaching out!! I’m a fairly competitive triathlete that got into plants about two years ago strictly for health/performance purposes. Though it’s crazy how after I entered the “plant strong” realm I came to better understand the animal rights point of view. I’m far from an activist, but I like to think I’m a bit more sympathetic with the efforts by folks like yourself. Nice work! Looking forward to checking out your recipes. Cheers!